This is “Relating Inflation and Unemployment”, section 16.1 from the book Macroeconomics Principles (v. 2.0). For details on it (including licensing), click here. Draw a short-run Phillips curve and describe the relationship between inflation and unemployment that it expresses. Describe the other relationships or phases that have been observed between inflation and unemployment. It has often been the case that progress against inflation comes at the expense of greater unemployment, and that reduced unemployment comes at the expense of greater inflation. This section looks at the record and traces the emergence of the view that a simple trade-off between these macroeconomic “bad guys” exists. Clearly, it is desirable to reduce unemployment and inflation. Unemployment represents a lost opportunity for workers to engage in productive effort—and to earn income. Inflation erodes the value of money people hold, and more importantly, the threat of inflation adds to uncertainty and makes people less willing to save and firms less willing to invest. If there were a trade-off between the two, we could reduce the rate of inflation or the rate of unemployment, but not both. The fact that the United States did make progress against unemployment and inflation through most of the 1990s and early 2000s represented a macroeconomic triumph, one that appeared impossible just a few years earlier. The next section examines the argument that once dominated macroeconomic thought—that a simple trade-off between inflation and unemployment did, indeed, exist. The argument continues to appear in discussions of macroeconomic policy today; it will be useful to examine it. In 1958, New Zealand–born economist Almarin Phillips reported that his analysis of a century of British wage and unemployment data suggested that an inverse relationship existed between rates of increase in wages and British unemployment.Almarin W. Phillips, “The Relation between Unemployment and the Rate of Change of Money Wage Rates in the United Kingdom, 1861–1957,” Economica 25 (November 1958): 283–99. Economists were quick to incorporate this idea into their thinking, extending the relationship to the rate of price-level changes—inflation—and unemployment. The notion that there is a trade-off between the two is expressed by a short-run Phillips curveA curve that suggests a negative relationship between inflation and unemployment., a curve that suggests a negative relationship between inflation and unemployment. 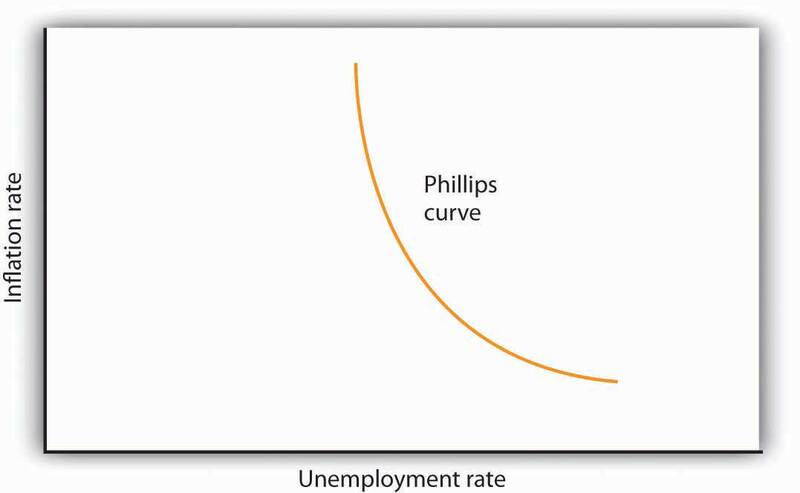 Figure 16.1 "The Short-Run Phillips Curve" shows a short-run Phillips curve. The relationship between inflation and unemployment suggested by the work of Almarin Phillips is shown by a short-run Phillips curve. The short-run Phillips curve seemed to make good theoretical sense. The dominant school of economic thought in the 1960s suggested that the economy was likely to experience either a recessionary or an inflationary gap. An economy with a recessionary gap would have high unemployment and little or no inflation. An economy with an inflationary gap would have very little unemployment and a higher rate of inflation. The Phillips curve suggested a smooth transition between the two. As expansionary policies were undertaken to move the economy out of a recessionary gap, unemployment would fall and inflation would rise. Policies to correct an inflationary gap would bring down the inflation rate, but at a cost of higher unemployment. The experience of the 1960s suggested that precisely the kind of trade-off the Phillips curve implied did, in fact, exist in the United States. Figure 16.2 "The Short-Run Phillips Curve in the 1960s" shows annual rates of inflation (computed using the implicit price deflator) plotted against annual rates of unemployment from 1961 to 1969. The points appear to follow a path quite similar to a Phillips curve relationship. The civilian unemployment rate fell from 6.7% in 1961 to 3.5% in 1969. The inflation rate rose from 1.1% in 1961 to 4.8% in 1969. While inflation dipped slightly in 1963, it appeared that, for the decade as a whole, a reduction in unemployment had been “traded” for an increase in inflation. Values of U.S. inflation and unemployment rates during the 1960s generally conformed to the trade-off implied by the short-run Phillips curve. The points for each year lie close to a curve with the shape that Phillips’s analysis predicted. Source: Economic Report of the President, 2011, Tables B-3 and B-42. In the mid-1960s, the economy moved into an inflationary gap as unemployment fell below its natural level. The economy had already reached its full employment level of output when the 1964 tax cut was passed. The Fed undertook a more expansionary monetary policy at the same time. The combined effect of the two policies increased aggregate demand and pushed the economy beyond full employment and into an inflationary gap. Aggregate demand continued to rise as U.S. spending for the war in Vietnam expanded and as President Lyndon Johnson launched an ambitious program aimed at putting an end to poverty in the United States. By the end of the decade, unemployment at 3.5% was substantially below its natural level, estimated by the Congressional Budget Office to be 5.6% that year. 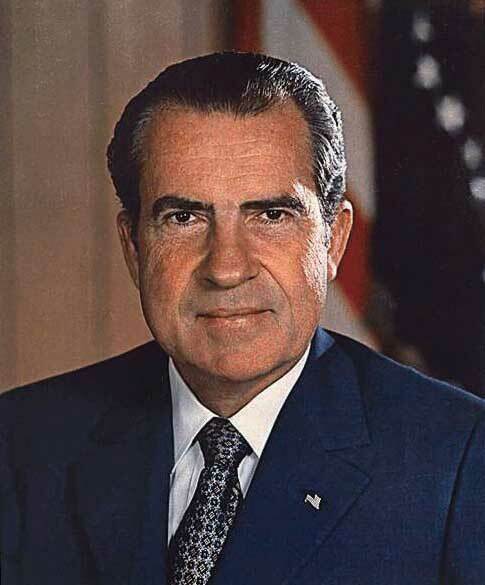 When Richard Nixon became president in 1969, it was widely believed that, with an economy operating with an inflationary gap, it was time to move back down the Phillips curve, trading a reduction in inflation for an increase in unemployment. President Nixon moved to do precisely that, serving up a contractionary fiscal policy by ordering cuts in federal government purchases. The Fed pursued a contractionary monetary policy aimed at bringing inflation down. The effort to nudge the economy back down the Phillips curve to an unemployment rate closer to the natural level and a lower rate of inflation met with an unhappy surprise in 1970. Unemployment increased as expected. But inflation rose! The inflation rate rose to 5.3% from its 1969 rate of 4.8%. The tidy relationship between inflation and unemployment that had been suggested by the experience of the 1960s fell apart in the 1970s. Unemployment rose substantially, but inflation remained the same in 1971. In 1972, both rates fell. The economy seemed to fall back into the pattern described by the Phillips curve in 1973, as inflation rose while unemployment fell. But the next two years saw increases in both rates. The negatively sloped Phillips curve relationship between inflation and unemployment that had seemed to hold true in the 1960s no longer prevailed. Indeed, a look at annual rates of inflation and unemployment since 1961 suggests that the 1960s were quite atypical. Figure 16.3 "Inflation and Unemployment, 1961–2011" shows the two variables over the period from 1961 through 2011. 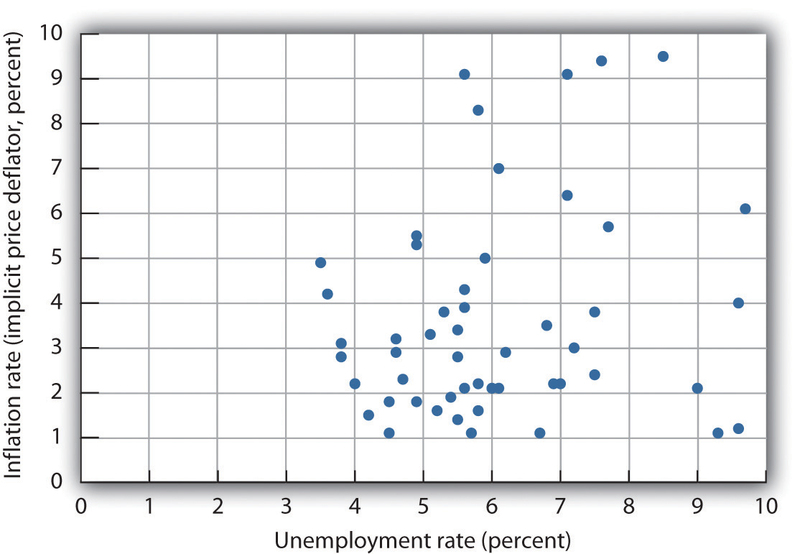 It is hard to see a negatively sloped Phillips curve lurking within that seemingly random scatter of points. Annual observations of inflation and unemployment in the United States from 1961 to 2011 do not seem consistent with a Phillips curve. Sources: Economic Report of the President, 2011, Table B-42; Bureau of Economic Analysis, Implicit Price Deflators for Gross Domestic Product, NIPA Table 1.1.9. Unemployment rate for 2011 is annual average from Bureau of Labor Statistics home page. 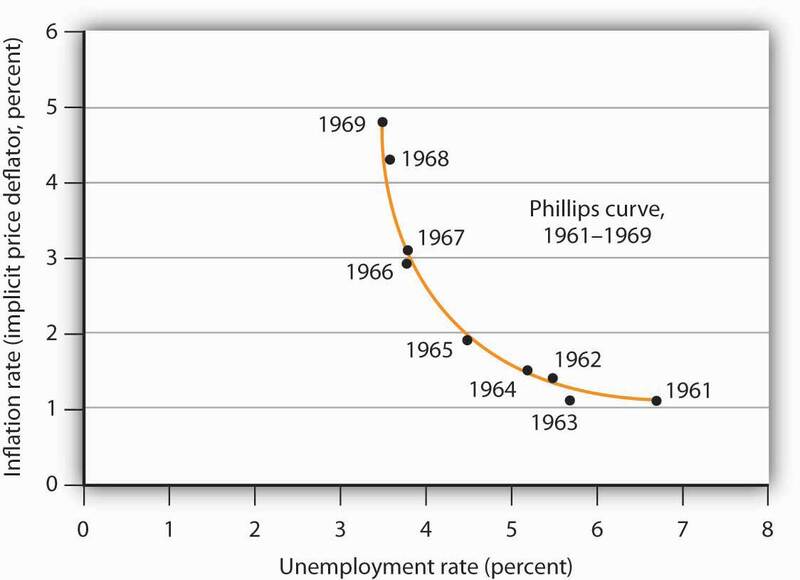 Although the points plotted in Figure 16.3 "Inflation and Unemployment, 1961–2011" are not consistent with a negatively sloped, stable Phillips curve, connecting the inflation/unemployment points over time allows us to focus on various ways that these two variables may be related. In Figure 16.4 "Connecting the Points: Inflation and Unemployment" we draw connecting lines through the sequence of observations. By doing so, we see periods in which inflation and unemployment are inversely related (as in the 1960s, late 1970s, late 1980s, the end of the twentieth century, and the first decade of the 2000s). We refer to a period when inflation and unemployment are inversely related as a Phillips phasePeriod in which inflation and unemployment are inversely related..
During other periods, both inflation and unemployment were increasing (as from 1973 to 1975 or 1979 to 1981). A period of rising inflation and unemployment is called a stagflation phasePeriod in which inflation remains high while unemployment increases.. Finally, a recovery phasePeriod in which inflation and unemployment both decline. is a period in which both unemployment and inflation fall (as from 1975 to 1976, 1982 to 1984, and 1992 to 1998). Figure 16.5 "Inflation—Unemployment Phases" presents a stylized version of these three phases. 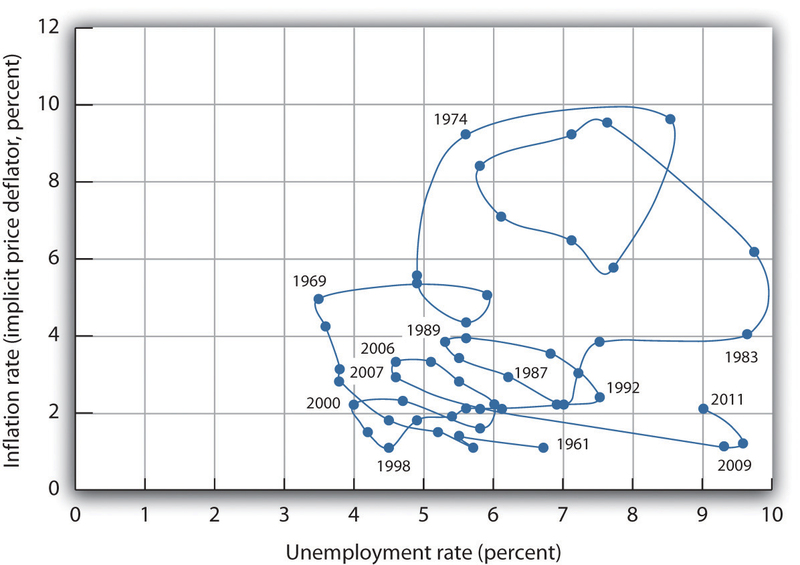 Connecting observed values for unemployment and inflation sequentially suggests a cyclical pattern of clockwise loops over the 1961–2002 period, after which we see a series of inverse relationships. Sources: Economic Report of the President, 2011, Tables B-3 and B-42. 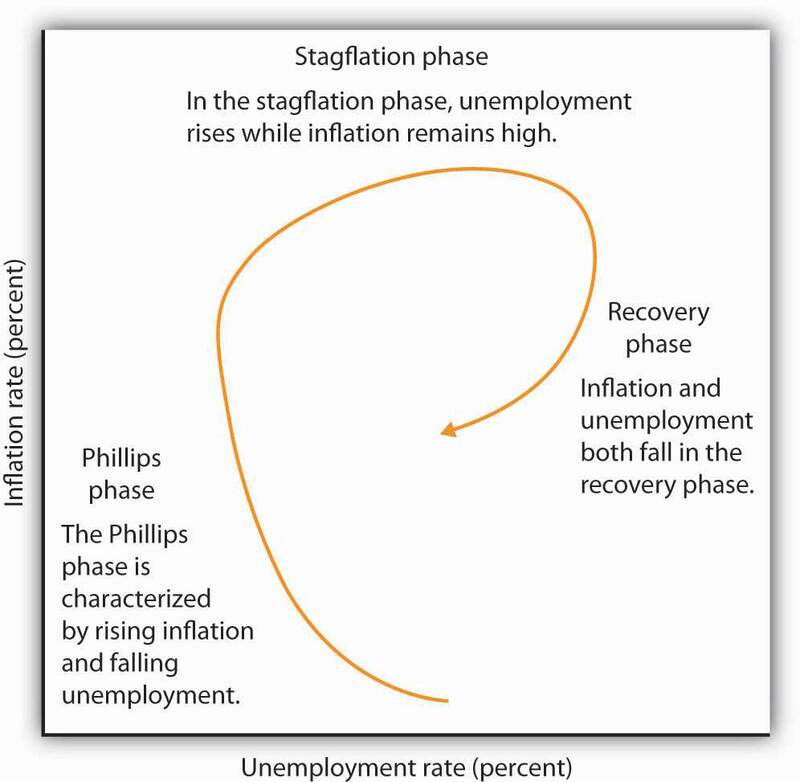 The figure shows the way an economy may move from a Phillips phase to a stagflation phase and then to a recovery phase. Trace the path of inflation and unemployment as it unfolds in Figure 16.4 "Connecting the Points: Inflation and Unemployment". 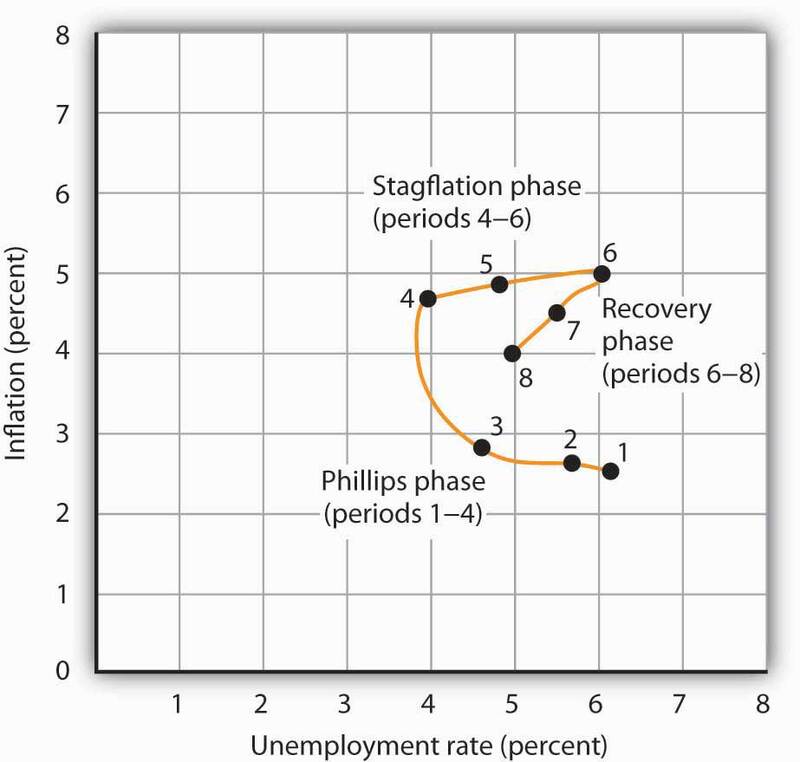 Starting with the Phillips phase in the 1960s, we see that the economy went through three clockwise loops, representing a stagflation phase, then a recovery phase, a Phillips phase, and so on. Each took the United States to successively higher rates of inflation and unemployment. Following the stagflation of the late 1970s and early 1980s, however, something quite significant happened. The economy suffered a very high rate of unemployment but also achieved very dramatic gains against inflation. The recovery phase of the 1990s was the longest since the U.S. government began tracking inflation and unemployment. Good luck explains some of that: oil prices fell in the late 1990s, shifting the short-run aggregate supply curve to the right. That boosted real GDP and put downward pressure on the price level. But one cause of that improved performance seemed to be the better understanding economists gained from some policy mistakes of the 1970s. The 2000s look like a series of Phillips phases. The brief recession in 2001 brought higher unemployment and slightly lower inflation. Unemployment fell from 2003 to 2006 but with slightly higher inflation each year. The Great Recession, which began at the end of 2007, was characterized by higher unemployment and lower inflation. The next section will explain these experiences in a stylized way in terms of the aggregate demand and supply model. The view that there is a trade-off between inflation and unemployment is expressed by a short-run Phillips curve. While there are periods in which a trade-off between inflation and unemployment exists, the actual relationship between these variables is more varied. In a Phillips phase, the inflation rate rises and unemployment falls. A stagflation phase is marked by rising unemployment while inflation remains high. In a recovery phase, inflation and unemployment both fall. Suppose an economy has experienced the rates of inflation and of unemployment shown below. Plot these data graphically in a grid with the inflation rate on the vertical axis and the unemployment rate on the horizontal axis. Identify the periods during which the economy experienced each of the three phases of the inflation-unemployment cycle identified in the text. Looking back, we may find it difficult to appreciate how stunning the experience of 1970 and 1971 was. But those two years changed the face of macroeconomic thought. Introductory textbooks of that time contained no mention of aggregate supply. The model of choice was the aggregate expenditures model. Students learned that the economy could be in equilibrium below full employment, in which case unemployment would be the primary macroeconomic problem. Alternatively, equilibrium could occur at an income greater than the full employment level, in which case inflation would be the main culprit to worry about. These ideas could be summarized using a Phillips curve, a new analytical device. It suggested that economists could lay out for policy makers a menu of possibilities. Policy makers could then choose the mix of inflation and unemployment they were willing to accept. Economists would then show them how to attain that mix with the appropriate fiscal and monetary policies. Then 1970 and 1971 came crashing in on this well-ordered fantasy. President Richard Nixon had come to office with a pledge to bring down inflation. The consumer price index had risen 4.7% during 1968, the highest rate since 1951. Mr. Nixon cut government purchases in 1969, and the Fed produced a sharp slowing in money growth. The president’s economic advisers predicted at the beginning of 1970 that inflation and unemployment would both fall. Appraising the 1970 debacle early in 1971, the president’s economists said that the experience had not been consistent with what standard models would predict. The economists suggested, however, that this was probably due to a number of transitory factors. Their forecast that inflation and unemployment would improve in 1971 proved wide of the mark—the unemployment rate rose from 4.9% to 5.9% (an increase of 20%), while the rate of inflation measured by the change in the implicit price deflator barely changed from 5.3% to 5.2%. As we will see, the experience can be readily explained using the model of aggregate demand and aggregate supply. But this tool was not well developed then. The experience of the 1970s forced economists back to their analytical drawing boards and spawned dramatic advances in our understanding of macroeconomic events. We will explore many of those advances in the next chapter. Source: Economic Report of the President, 1971, pp. 60–84.